I passed this dog at about mile seven of a ten-mile walk, last weekend. It struck me as funny and noteworthy: a dog, hanging out in a public tennis court, with little sign of its human anywhere. 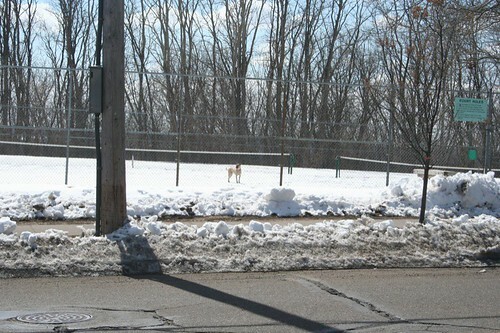 It was a beautiful, sunny day; I caught two photos, one with the dog looking left, and one with it looking right. After taking the photos, I tucked the camera away and continued on. About three weeks ago, the reality of my having signed up to do a 20-mile charity walk in June hit me: my weekends now need to include long walks, so that my body is prepared to walk quite a few of the streets of New York, starting around dusk, and ending around dawn. I’ll be doing it with thousand of other like-minded, like-hearted people. What is surprising me is that the walks may also be preparing me mentally for the event, as well. Many of the training walks can be shorter, from 2-5 miles in length, and those take so little time that they are just a blink in the day, or maybe an album of songs on my iPod; not a lot of time to contemplate much other than what dinner may be or if I need to write an email message when I get back to my desk. The longer walks have been taking around three hours, which takes so many songs that I lose count. The position of the sun in the sky changes. More of the day goes by, between when I leave the house, and when I come back. I get hungry again. Entire icebergs in the driveway melt. I’ve gone on runs that take this long, but time doesn’t slow down like this, when I run. I’m sure it doesn’t compare, but this passage of time does carry my mind toward the likely eternity of sadness that my sister-in-law felt, when she was driven to take her own life, nearly five years ago. I’m disappointed and heartbroken that I didn’t get to know her better, but I feel fortunate that I got to meet her at all. Evidently this is one of the tests that this life will throw me and my family: I expect more challenging ones to come, but I feel that I might be able to make a difference to others, with this particular one. I’m choosing to try and raise some money and awareness, to try and prevent suicide, but also to help those who have had to address it, in their families and themselves. I’ve signed up to participate in the Out of the Darkness Overnight. I have reached out to some family and friends, but if you have wandered onto this page, and I haven’t yet reached out to you, I, Steve, Mary and countless others would love your support, with encouraging words or even a donation via the link in this paragraph, to “Jenny’s Team.” Thank you!